As we’ve finished our summer wedding season I thought I’d look back at the detail of some of the weddings we’ve had here at Ever After in 2015. I’m thrilled to be able to share this behind the scenes look at the wedding flowers from one of our early weddings this year. 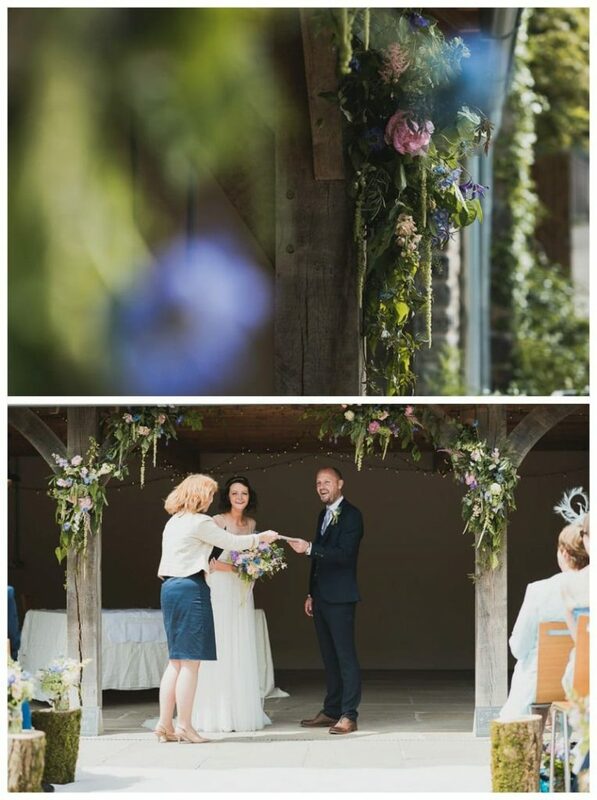 Fiona and James were married here at Ever After in the first week of June and after asking me for recommendations for local florists, they engaged one of our favourites, Deborah of Dartmoor Flowers to create their wedding flowers. Fiona and James made arrangements to meet Deborah here at the venue. They had some ideas about floral decor and wanted to meet on site to see whether their ideas were practical. I asked Deborah to take us through the process with couples, using Fiona and James as an example, how to choose which arrangements to have and how to pick which flowers to use. 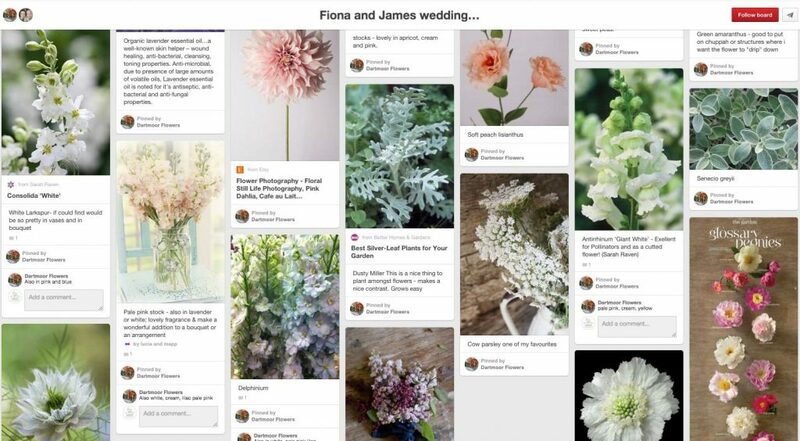 Deborah created a pinterest board to share with Fiona specifically for her wedding and I wanted to post that here so you can see the similarities and differences between the pinterest board and the actual wedding. 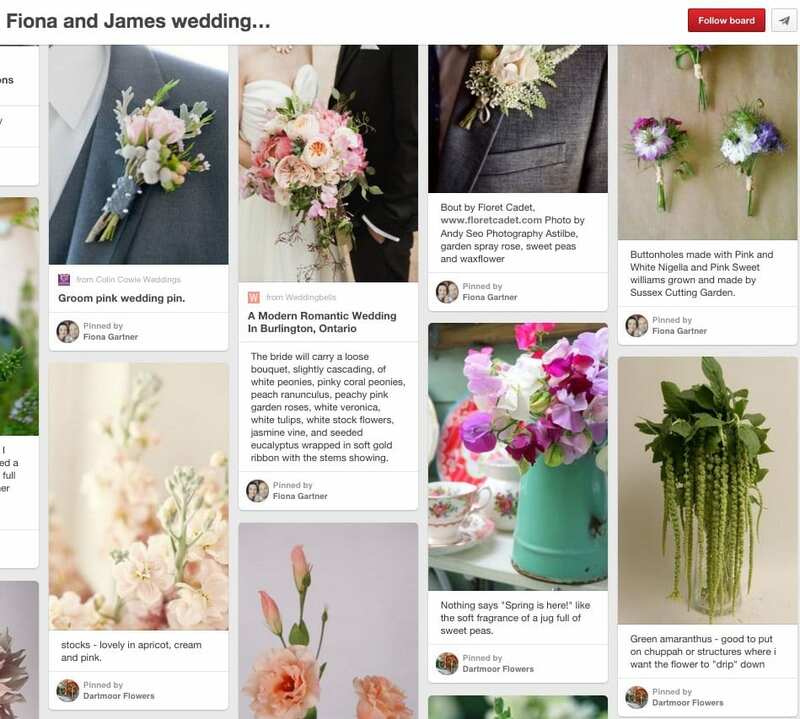 Follow the board on Pinterest. Over to Deborah: “When I meet couples for the first time I ask them if they have a certain ‘style’ (I don’t like the word ‘theme’) and if there are any flowers that have any special meaning for them or even flowers they don’t like. I need to know what colour the bridesmaids are wearing and the style of dress the bride has chosen. Fiona wanted pastel, spring colours with a natural, relaxed, hand-picked feel. She loved peonies so they were a must for her bouquet and trailing green amaranthus was also a favourite. After our first meeting we shared more ideas on pinterest and I made suggestions based on what Fiona liked and importantly, what was going to be in season at the beginning of June. The flowers we used were pale pink peonies, pale blue scabious, cream and lilac stocks, blush garden roses, ammi (lace flower), astrantia, cornflowers, astilbe and veronica – all flowers that were in season but provided different textures, shapes and sizes to give the designs more interest. We added mint and rosemary foliage for fabulous scent. Deborah told me, “All flowers wilt to a certain degree in full sunshine but some do better than others. The best flowers to withstand the sun are woody and hard-stemmed varieties like roses, lisianthus, hydrangeas, lilies and carnations which can retain moisture better than delicate soft stem flowers. 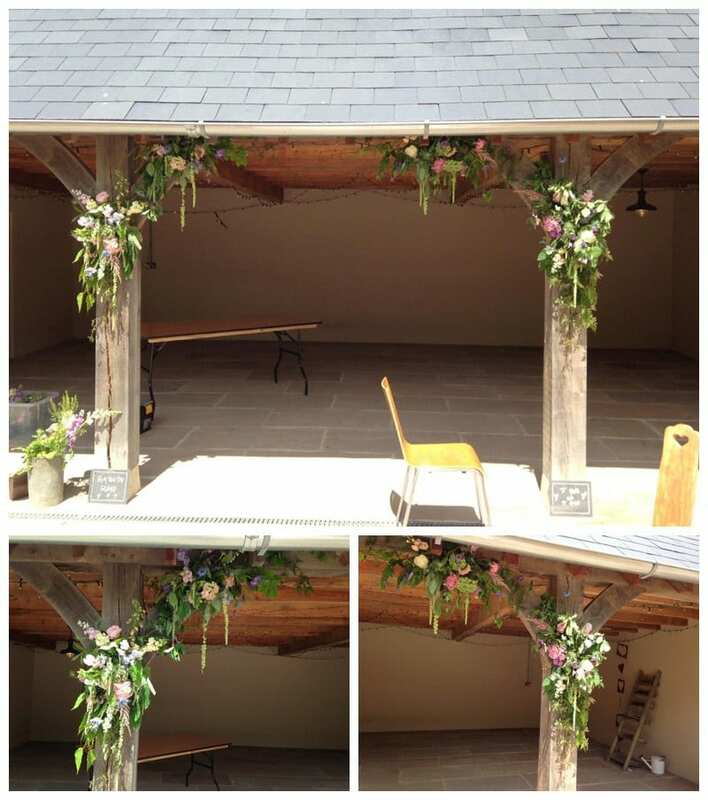 For Fiona and James’s flower arch I used peonies, roses, amaranthus, stocks, foxgloves, hydrangeas, astilbe and scabious. For additional foliage I used ivy, honeysuckle and jasmine trails. What I take away from Deborah’s description of the process is the combination of the aesthetic and the practical. It’s definitely important to know how you want the flowers to look but it also helps to know what’s in season and what practical issues to consider eg what might suffer in the sun. That’s why it’s great to have an expert like Deborah on hand to guide you using their skills and knowledge and of course do all the hard work! 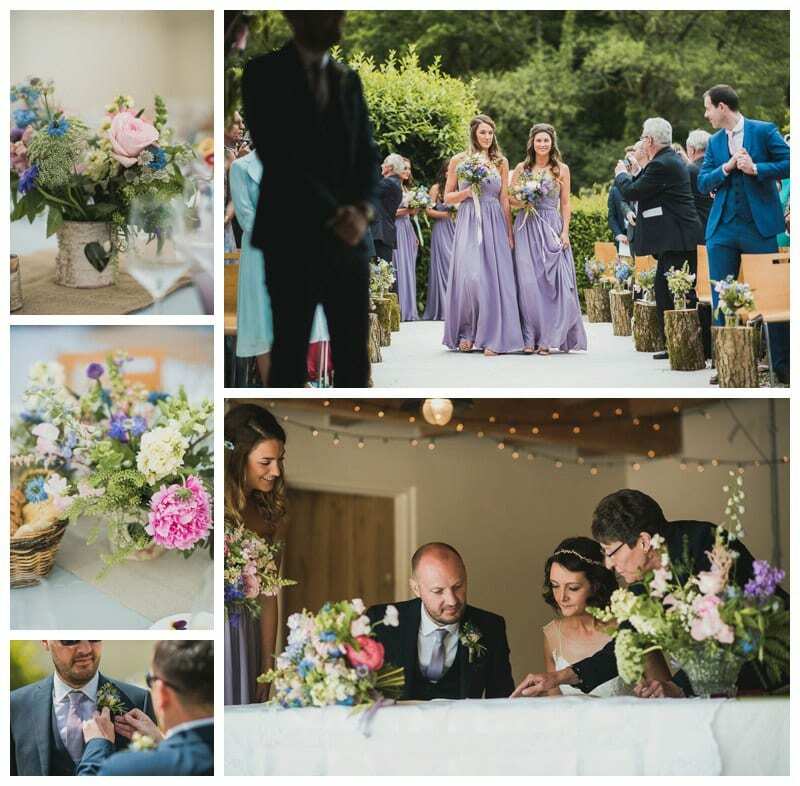 Take a look at this selection of shots of the wedding flowers on Fiona and James’s wedding day itself to see how Deborah wove the colours and feel through all the different arrangements to create a coherent whole. Tomorrow we’re going to look in detail at the bouquets Deborah created for Fiona, including the all important bridal bouquet and how to move your flowers around during the day so they work harder for you. We’ll also hear about how Deborah used pinterest to guide Fiona on a question she wasn’t sure about.